No matter if your Dallas-Fort Worth business is local, state-wide, or national, Overhead Garage Door, LLC has commercial garage door services to meet your company’s needs. Overhead doors and garage doors for commercial facilities come in all levels of design and materials, and nearly every shape and size for any business use. 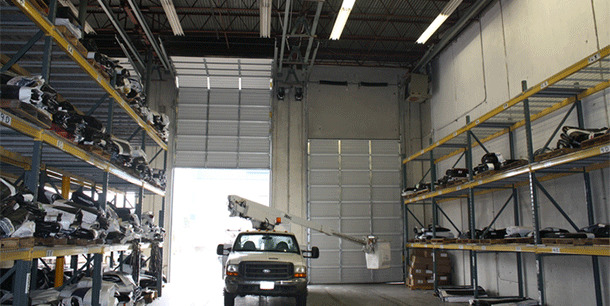 The popular high lift commercial garage doors are a perfect sure for loading and unloading at storage and warehouse facilities. When a local broadcasting company was in need of commercial garage door replacement for their equipment storage building, they called upon Overhead Garage Door, LLC for immediate service. After an extensive consultation appointment, our Dallas commercial garage door specialists provided the broadcasting company’s manager the best available options for their overhead door replacement requirements. Particularly, the 16′ x 14′ high lift sectional commercial doors were the best choice as well as the automatic garage door openers. After placing the order with the manufacturer with the proper measurements and specifications, we scheduled the installation date. Within a week our Dallas commercial garage door installation staff was at the station setting up the brand-new high lift sectional doors. These doors are constructed to last, the garage door manufacturer guarantees their product, and we guarantee all of our garage door repairs, parts, and installations as well. For any and all of your company’s commercial garage door service needs, Overhead Garage Door, LLC is on your side.